5052 aluminum sheet of Haomei Alu is certificated to ASTM B209 and it can be cut to size at customers' need. The main content is Mg, which improve the strength of 5052 aluminum sheet. Products with different thickness have different tensile and yield strength, as well as elongation, all of which live to international standards. 5052 aluminum sheet is stronger than 1100 and 3003 and it is an excellent candidate for most processing techniques. 5052 aluminum sheet is light in weight, nonmagnetic and non-heat treatable. It has good workability and high fatigue strength with good resistance to correction even in salt water. Besides, it can be anodized to improve correction resistance of the material in corrosive environment. So 5052 aluminum sheet is high suitable for marine applications. 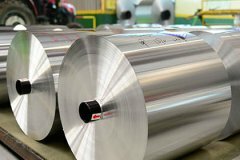 For the characteristics above, 5052 aluminum sheet can be applied to bodies of boats, buses, trucks and trailer, as well as for chemical drums. And it is also vastly used to electronic casings, such as notebook computers and televisions, giving the customer a sense of quality and value. 5052 aluminum sheet is also environment friendly for aluminum is infinitely recyclable.